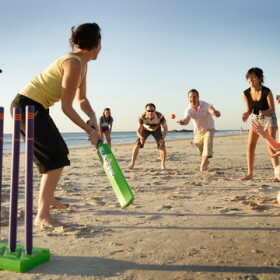 Trinity Hill is bringing back swashbuckling old-school holidays, with country and coast in perfect harmony. 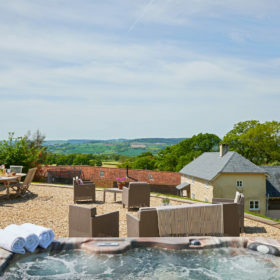 Where Devon meets Dorset, the main house, Dairy, Applestore and Haybarn come with oak beams, exposed stone and a bubbling hot tub. 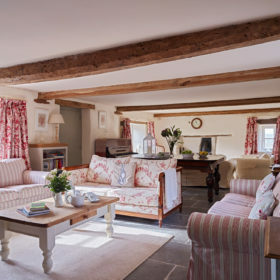 A giant escape for 18, this is rural, homely heaven on a grand scale. 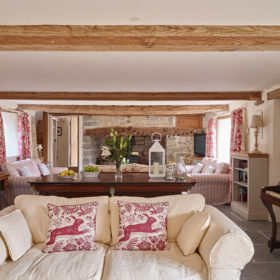 Oak beams, log fires and good times. 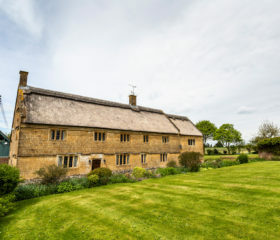 The main house, the Dairy, the Applestore and the Haybarn sound like locations from an Enid Blyton novel. 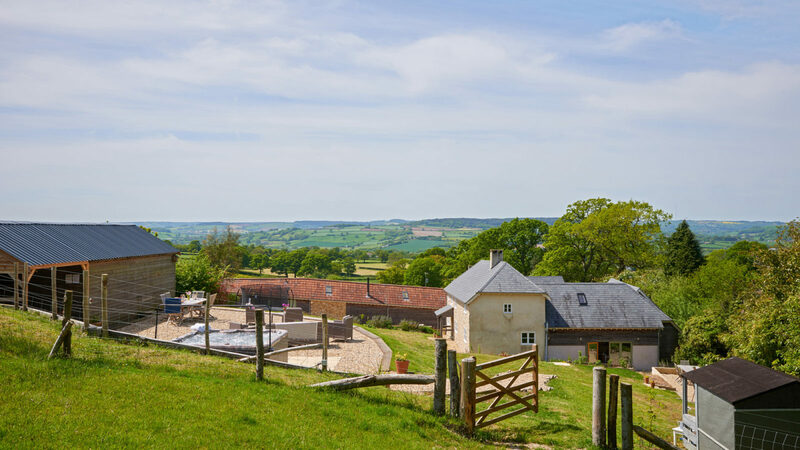 So pack plenty of ginger beer and head down to the Devon-Dorset border to Trinity Hill, home to swashbuckling old-school holidays, waddling ducks and bleating sheep. 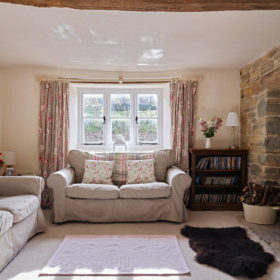 This is a fully-fledged farm, but one that comes with oaken beams, exposed-stone walls, wifi, and room for a flock of 18. 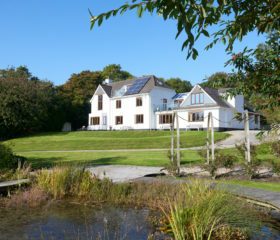 In between the kids’ playhouse, table football, trampoline and pool table, everything’s very grown-up. 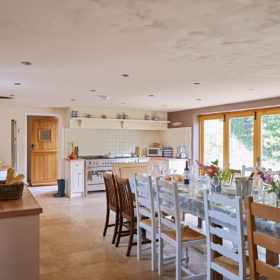 Cook local fare on the Smeg double-oven, bundle the logs onto the woodburners, dine on the terrace. 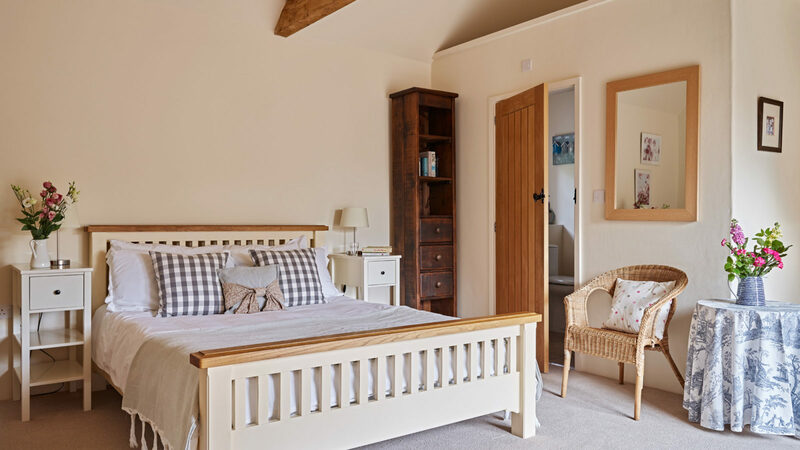 Among the rolling hills that wend their way down to the soft sands of Lyme Regis, you’ll sleep deeply in soft-cotton beds and wake refreshed, reminded of the joy of fresh, light, vaulted spaces. Bathe in the freestanding bath. Dive into the bubbling hot tub. 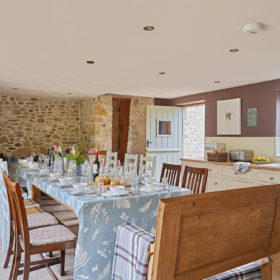 Eat around the 18-seat dining table with the stable door open to the rural air. 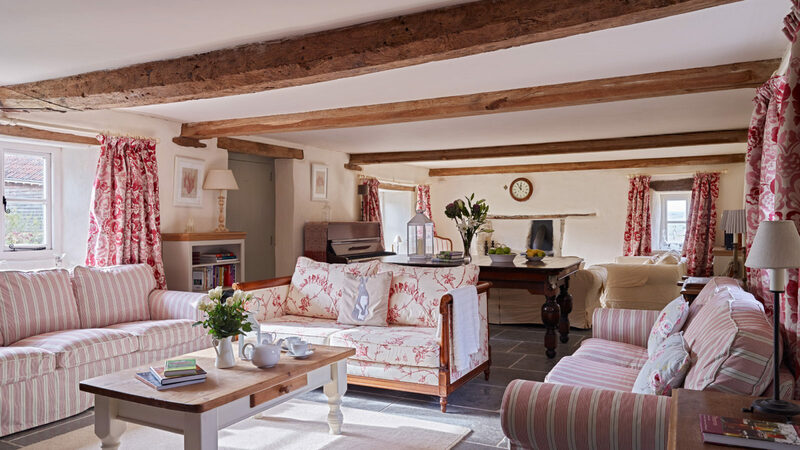 Wander the acreage to plodge in the shallow brook, or trek a little further with torch and hi-vis jacket to reach River Cottage, for wining and dining at TV’s most famous farmhouse. Take in the rolling views on your return, knock the mud from your boots, load up the fires and fire up your glasses. The night is yet young. 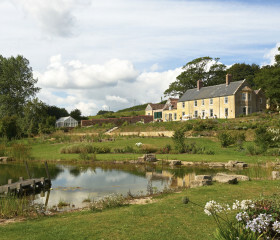 Wander the half-acre garden that expands to a 50-acre farm spreading like a patchwork quilt down to the Devon coast. Say hi to the runner ducks, hens and geese, revel in the reassuringly rural sound of the lambs at the door. Put on your wellies and potter down to the babbling brook. 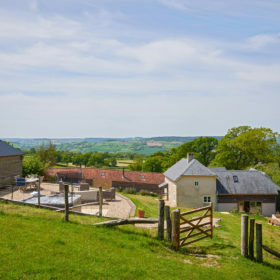 Walk the farmland for half an hour over towering hills and deep valleys to River Cottage, for farmhouse lunches, cookery courses or barn dinners on long trestle tables. 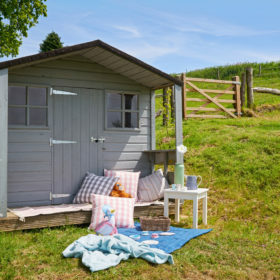 Kids might prefer the playhouse, the ping-pong table and the trampoline. 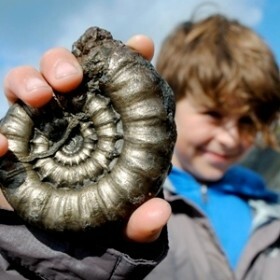 After a day finding fossils on the Jurassic coast or a busy time on the beach, come back for a barbie on the patio and a view of the sun setting over the hills. 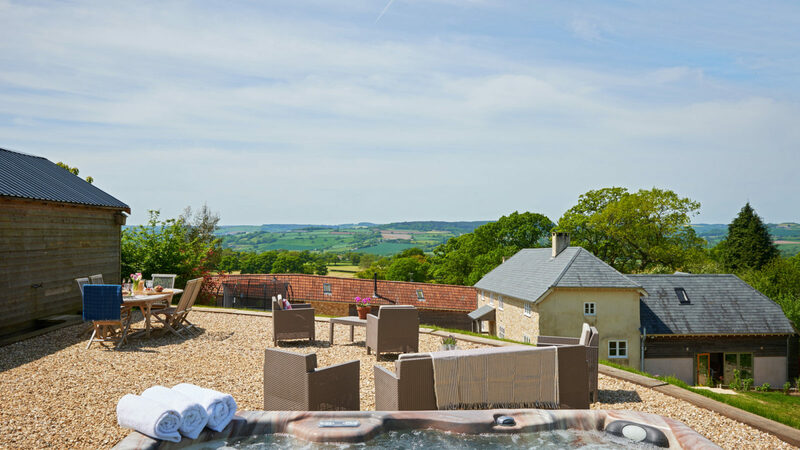 Top things off with a cheeky nightcap and a dip in the seven-seat hot tub. 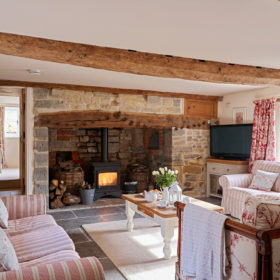 Get the fire going in the main house lounge big enough for 18 guests, settle back on the sofas in the snug or get a movie going in the Haybarn lounge. Spaces at Trinity Hill are white-walled, oak-beamed, exposed-stone havens of peace, ping-pong and a little snooker on a half size slate bedded oak table. Oh, and the piano. Tickle the keys awhile and sing along. Feed the fire from the basket of logs and tip the honesty box when you top up. Keep in touch with the world on wifi fed from booster boxes. 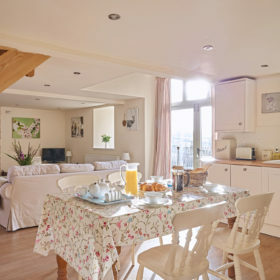 Pour hot drinks from the cafetiere and cold ones from the American-style fridge-freezer. In house yoga and beauty therapy and pamper options are available, just ask and we will get the right person for you. 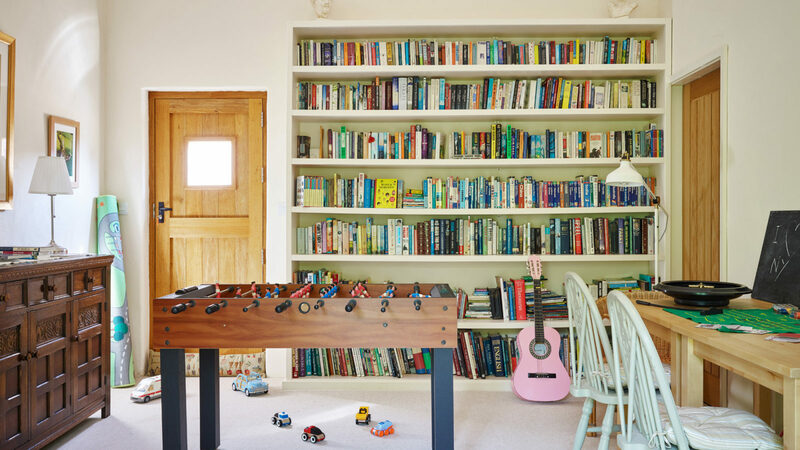 Kids can escape to the separate games room, groaning with books and board games and ready for a table-football showdown. 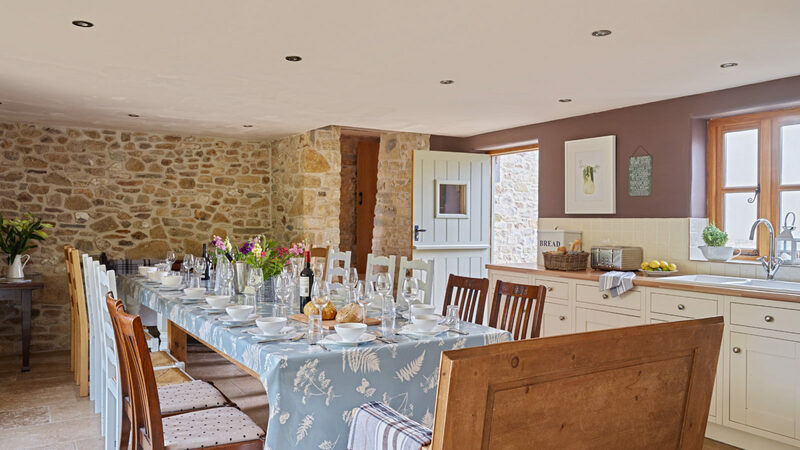 Just a stroll across the fields lies the ultimate foodie experience, with cookery courses, farmhouse dinners and barn feasts at River Cottage, TV’s best-loved farmhouse. 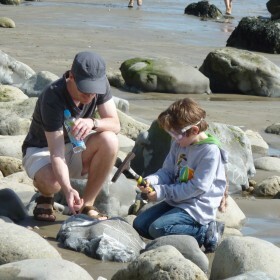 Closer to home, facilities are fine enough to give Hugh Fearnley-Whittingstall a run for his money. 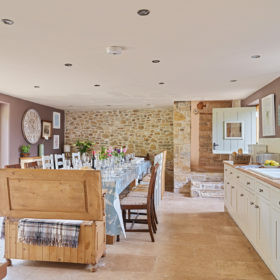 The main house kitchen comes with a stainless-steel Smeg double oven that, at 90cms and 60cms, is big enough to feed the 18 that sit in comfort around the farmhouse dining table. 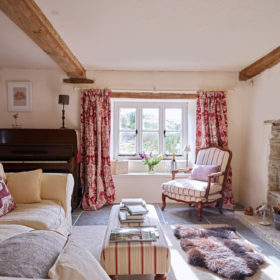 On fine days, open up the French windows or stable door and let in a little rural air as you pass the gravy and uncork the wine. 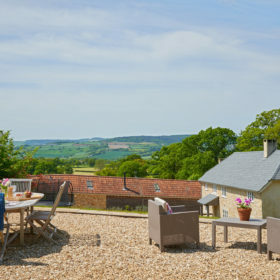 Elsewhere, a single oven and hob offers a little self-sufficiency for residents of the Haybarn, and there’s plenty room out on the sun deck for sizzling steaks as the sun dips deep and red over the Blackdown Hills. Grab takeaways from Italian at Le Pisani or Indian from Khushi Kitchen. Stock the fridge from Miller’s Farm shop. 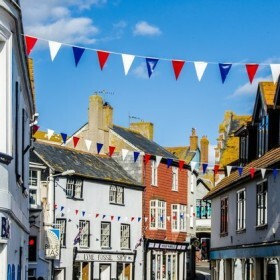 Call in Eat Nice Be Nice for in-house grub from ex-River Cottage chefs who can use the on site caters kitchen, or head out to the Tytherleigh Arms for five-star seasonal menus, to the Ship Inn for fresh Lyme-Bay fish or hand-picked crabs from Beer. 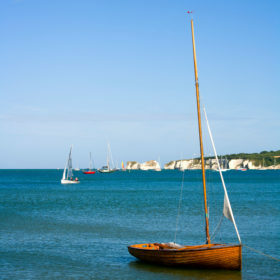 Or ramp up the Scandic style at Hix, with the day’s catch served on the terrace with views over Lyme Bay and the Cobb. 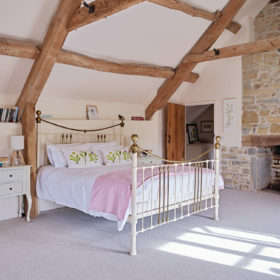 Bedrooms at Trinity Hill overwhelm you with their clean simplicity, their beamed, vaulted sense of space and their crisp linen. Sleep deep and long with memories of today fresh in your head and the promise of an English breakfast to kick-start tomorrow. In the main house, the master bedroom sleeps four in a superking and two singles, with plenty room for cots and put-up beds, too. An en-suite family bathroom comes with bath and separate shower. 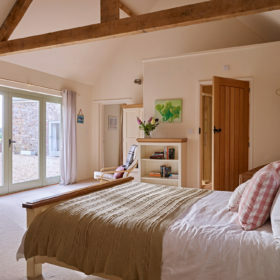 Bedrooms two and three are kingsize rooms (one zip-and-link) with a shared family bathroom. 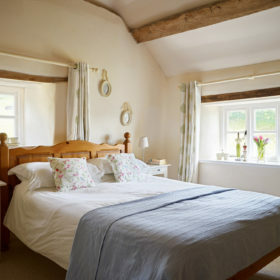 Bedrooms four and five each sleep three in a kingsize and a single with an en-suite shower. Located on the ground floor, these rooms let you waltz through double doors onto the patio for breakfast. 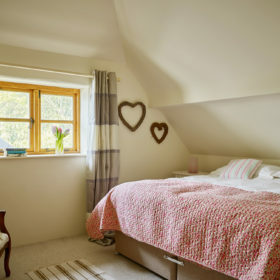 Bedroom six is a double with en-suite shower, while bedroom seven is a superking with en-suite shower that will convert to twin beds thanks to the miracle of zip-and-link. That’s a grand total of 18 plus cots and a put-up. Six beautifully equipped bathrooms ensure comfort all round. 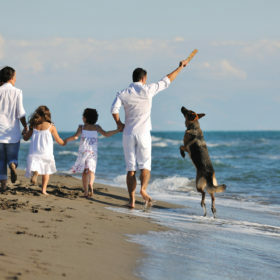 Could the younger generations want for more? 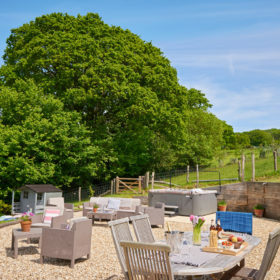 A mere 15 minutes from Lyme Regis and with all manner of beautiful countryside surrounding the property, there’s no end to the possibilities of fun for kids here. 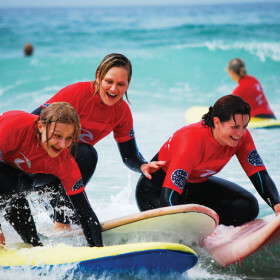 Whether it’s searching for life in the rock pools, exploring caves, building sandcastles between swims, or venturing out to the neighbouring towns to soak up the rich local culture and history – there’s something for every age. 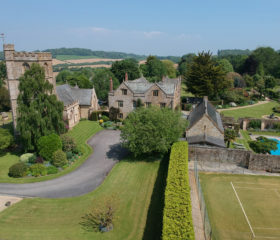 At the house, let the older children disappear into the grounds and enjoy a game of football, and the freedom to make as much noise as they please… Cartwheel across the lawn or race from end to end – see if they can wear themselves out before bed and work up an appetite for burgers in buns fresh from the barbecue. If you can coax them indoors, you’ll find games, books and toys waiting to be discovered. Prepare the hot chocolate and marshmallows, and settle down for a family night in.